Here's another little Christmas project but it could easily be adapted to suit any occasion. It's a kind of book fold, shadow box type card which I had made previously to gift home made cookies in. 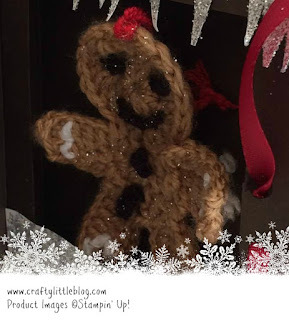 Only the cookies are gone now and I forgot to take photos so I popped a little crochet gingerbread man tree decoration in there instead to act like a cookie for this Christmas themed version. ...who doesn't like a scrummy home made cookie? Making one of these to present it in makes it great for gifting teachers and colleagues or for takeaways from Christmas events or to sell at fayres, cake bake sales at your children's school... just about anything (just stay within the law as regards sale and prep of food, I don't think it much matters if you're gifting to people you know). So this one was made using some of the cutest of the brand new Stampin' Up! DSP from the new Autumn and Winter 2017 catalogue. Click here to go shop from that if you want to. I will be making a video tutorial for this but I'll just tell you quickly that I made the shadow box and card front/lid using Early Espresso card stock. I made it in two parts (the shadow box and the front cover) which I attached together using Tombow liquid adhesive. The finished dimensions are 4 x 4 x 0.5 inches deep. 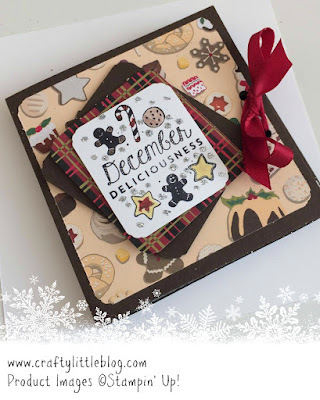 On the front of the card I used one of the gorgeous designs from the Christmas Around The World DSP stack which is so appropriate for foodie gifts this Christmas. I then made a tag by cutting out almost square shapes by hand using first of all a piece of Early Espresso, then the gorgeous tartan/plaid DSP which is the reverse of the same DSP used to top off the box front and then a piece of Whisper White which I'd printed one of the sentiments from The Little Things stamp set onto using Basic Black and which I'd then used reds, yellows and browns with an Aqua Painter to add some colour to. 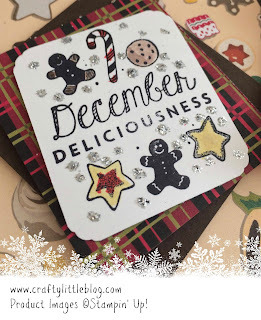 I used a little corner of scrap card stock to dot around Tombow and then added some silver glittery accents. The tag was built up using dimensionals and I off set each layer to give a more interesting, jaunty look to it. To finish off I punched a couple of holes through the front cover lined up with holes in the right hand side of the shadow box frame and added a piece of Cherry Cobbler silky taffeta ribbon which I believe is still available on the Clearance rack along with a spool of Emerald Envy for just £3.30 for 5 yards of each! Go grab some it's gorgeous. The price in the link below will change once you drop the ribbon combo into your basket. There are also Christmas goodies at ridiculously low prices there too. So that's that. Videos are going to start being uploaded next week so watch out for some of my most recent projects in video tutorial format at last! As always everything is listed below with clickable links and if you would like to know anything about Stampin' Up! products or this project, just ask. You can email me by clicking here or you can leave me a message in the comments. Thanks as always for dropping in and have fun making this project for yourself.